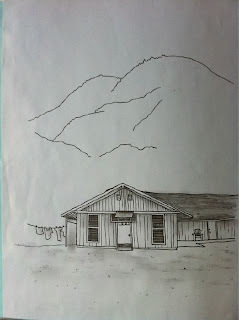 As a Monday afternoon, or morning depending on where you are, treat, Nate Duval has posted an original drawing that was used in creating his Damon Carlton and a Polar Bear poster "The Barracks". Nate has also been posting lots of sketch images of his poster work, take a look at his Twitter accout @NateDuvalfor more links. Click here to see the image on Nate's yFrog page or click the image.